William Edson Taylor was a member of the 545th Bomb Squad of the 384th Bomb Group of the 8th Air Force in WWII. He came from Ironwood, Gogebic County, Michigan. Ironwood is the westernmost city in Michigan and is separated from Hurley, Wisconsin by the Montreal River. Ironwood is about eighteen miles south of Lake Superior. These days, Ironwood is known for its downhill ski resorts, but back in the 1940’s, it was a mining town. William was born in Ishpeming, Michigan on on April 21, 1923 to Carroll Cushing (1895 to 1993) and Ruth Edna Parmelee (1895 to unk.) Taylor. By 1930, the Taylor family had moved to Ironwood where Carroll worked as an engineer for an iron mine. William’s sister, Carol Jane, was born about 1925. On April 26, 1943, at the age of twenty, William enlisted in the Army Air Forces in Kalamazoo, Michigan. He trained to be a radio operator and during combat training, William was selected to serve on the James Joseph Brodie crew. He was assigned to the 384th Bomb Group, 545th Bomb Squadron on AAF Station 106 Special Orders #148 dated July 26, 1944. William flew his first seventeen missions as radio operator/gunner with the Brodie crew. But, on the crew’s next mission, on September 28, 1944, William was not called on to fly with the Brodie crew. On that mission, a radio operator new to the 384th, Donald William Dooley, was assigned to fly with the Brodie crew. 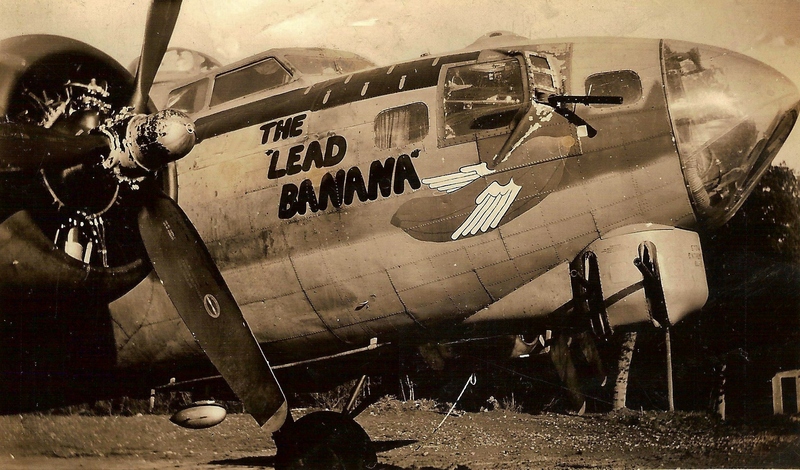 Dooley had recently transferred in from the 482nd Bomb Group. 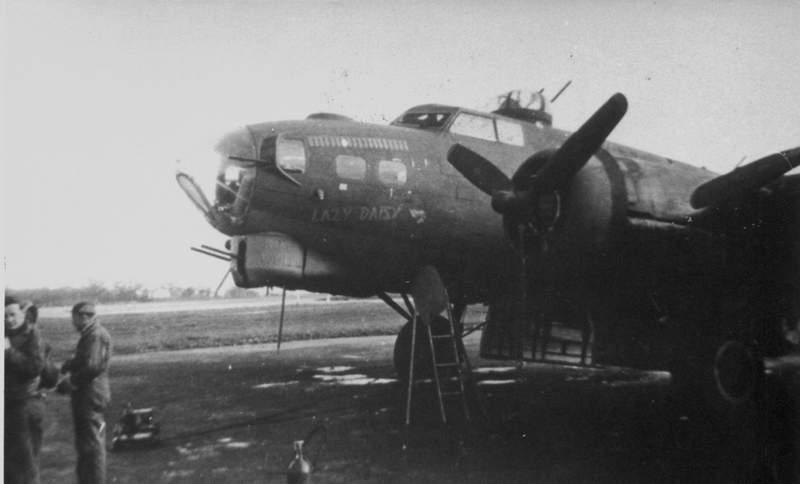 It was William’s good luck to sit out the September 28th mission, as the Brodie crew, aboard Lazy Daisy, went down after a mid-air collision coming off the target at Magdeburg. When the formation came back to Grafton Underwood, William learned that his crew was gone. Two days later, he was assigned to fly with the Loren Green crew, and after that continued to fill in with other crews on his next two missions. On October 5, he flew with the Robert Birckhead crew on a mission to Cologne aboard unnamed flying fortress 43-38579. The Birckhead crew’s fort was damaged by flak and left the formation under control prior to the target. But the damage was too great to make it back to Grafton Underwood and the fort crashed near Munchen-Gladbach. Four of the crew were killed, including pilot Robert Birckhead. Five became POWs, including radio operator William Edson Taylor. This was the first time I had ever flown with this crew – in fact, it wasn’t a regular crew. As a consequence I was not familiar with any one of them, except Adams, the tail gunner, who I knew slightly. The plane was hit by flak and immediately dropped out of formation. It was on fire. Crew members in the nose bailed out first and the others from the waist back after the plane exploded. So we didn’t land together and I had no chance to observe what happened to the others. The aircraft struck the ground near Gelsinkirchen. Several of the surviving crew noted in the Missing Air Crew Report (MACR9754) that Birckhead survived the crash, but died the next day in the hospital from head injuries and/or internal injuries. One of the crew members noted that this mission was Birckhead’s first mission of his second tour. In fact, it was the third mission of Birckhead’s second tour, but the first as pilot of his own crew. On his first two missions of his second tour, he flew as co-pilot. William Taylor was confined to Stalag Luft IV, the same prison camp two others from the Brodie crew – Wilfred Frank Miller and Harry Allen Liniger – had been taken to the week before after surviving the mid-air collison on September 28. William Edson Taylor survived Stalag Luft IV and he survived the eighty-six day, five hundred mile forced march out of the prison camp westward across Germany. In 1967, he married Barbara Elizabeth Magill (1925 – 2010) in Cook County, Illinois. William died January 29, 2002 in New Hope, Bucks County, Pennsylvania at the age of 78.